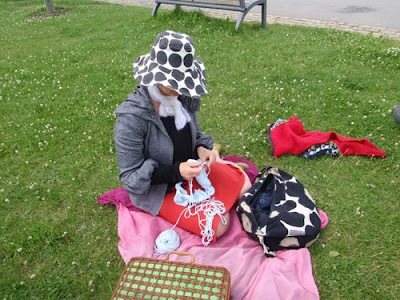 It´s the WWKIP ( World Wide Knit in Public 2009) this week (13-30th June). To be honnest, I never quite understood what´s the big deal about knitting in public... Half of my knitting book, I knitted at the playground while the girls were having fun in the sandbox. I still do, as you can see and for me, it´s WWKP almost everyday ! D´ailleurs, j´ai tricoté la moitié de mon livre dans les jardins publics tandis que les filles trafiquaient dans le bac à sable, et je continue ! Pour moi c´est WWKIP tous les jours ! I love it. It is such nice and positive graffiti as opposed to spray and destruction.